Mayor Stothert has been successful in her five years as Omaha mayor by being direct, transparent, inclusive and dedicated. She has reached out to various groups to build coalitions and support for community efforts, particularly in the area of public safety. She and her public safety leaders are trusted at an unusually high level for a larger city. She challenges business and civic entities when it is in the best interests of the public to do so. The past financial difficulties of the city have been addressed by Mayor Stothert and private and public investment in projects important to the city are again strong. Challenges for Omaha: Public safety is the number one issue in Omaha, NE, just as it is in most larger urban cities in the United States. Mayor Stothert works directly with police command and community leaders to build trust. She works to fund and promote those activities that have a positive impact on crime such as job training, educational programs, and summer youth employment programs. Violent crime is down in Omaha thanks to her hard work and that of the team she leads. 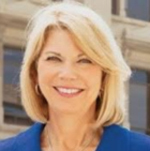 Jean Stothert is an exceptional woman who, since she war first elected Mayor of Omaha in 2013, has devoted all her energy to make the city a better place to live in. Omaha is not a city without its social and economic problems. But the Mayor has addressed many of the city’s problems and has clear ideas how to solve them. What people admire about Jean is that she is open and honest. She tells her fellow citizens what can be done, given the city’s resources and what not. No false promises, not even during her election campaign.